Yesterday I got to visit the new Microsoft Technology Center in St. Louis. The building is the latest investment in the Cortex Innovation District in midtown St. Louis. While Microsoft had a top floor view in a swanky office building in the St. Louis ‘burbs previously, this new building represents the shift in the way Microsoft is going about business. Its very location speaks to the millennialist desire to be situated in an urban center rather than alongside country clubs. Either way, Microsoft has clued into the fact that while people use technology, they don’t want to be manipulated like technology. Let people still feel like people, and let technology help them do people-like things. To that end, I don’t think it’s a coincidence that the new MTC has an extreme focus on organic materials and nature. Gone are the sterile all-white environments we’re used to seeing in office buildings. 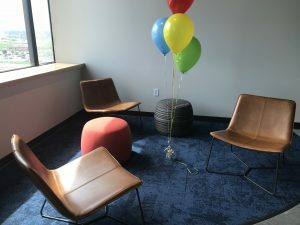 Instead, the office has a downright homey feel to it, like you’re being connected to the earth, not to a server farm in Fargo or even up the hall. 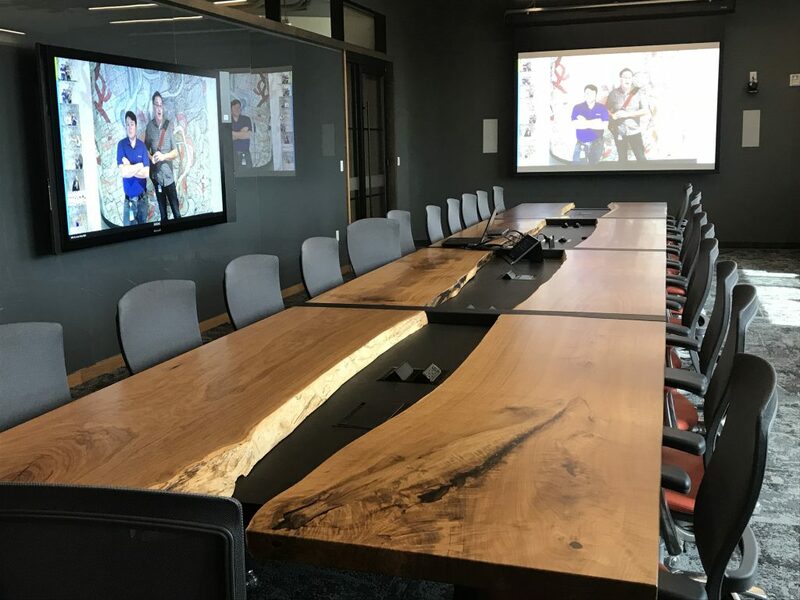 The main conference room table is not made of Formica but of giant hewn trees. There are benches with homey earthen-colored couch cushions on a long row of benches under the windows. 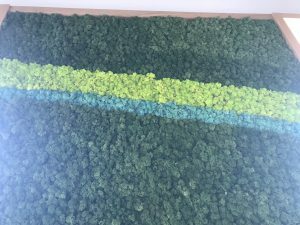 There were wall coverings that looked like they were made from spray-painted moss. (OK, so I have no idea how they possibly clean that in the future, but maybe living moss cleans itself?) I also saw chairs made of leather (another organic material) in the hall, with cushions in lively patterns, that give off a sort of native vibe. 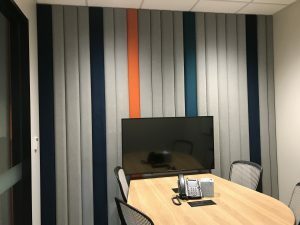 Another conference room had brightly colored fabric in a three-dimensional design that covered one of the walls. Something else I found very notable about the space: for taking up an entire floor of the beginning, there was only one room of desks crammed into a back corner; that single office space is for the architects who work at the MTC, guiding customers through the Microsoft line of products and helping them brainstorm and craft solutions. Gone are even the “squatters’ desks” for Microsoft employees to camp out at while visiting the Microsoft office. 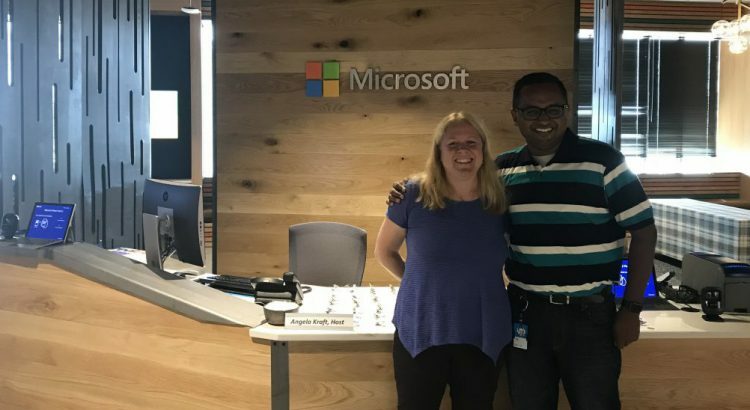 True, there are many little “telephone” rooms with a few couches and a lamp, but the idea is that Microsoft’s workforce is truly mobile, either working on-site with a client or at home. Microsoft’s $50 investment in St. Louis is good for the region. And selfishly, I can’t wait to host our St. Louis Office 365 User Group and SharePoint Saturday St. Louis here for years to come!